Hurricane Season in Full Swing, Don’t Forget Your Pets!! The hurricane season is in full swing and there is a very dangerous storm heading for the east coast. Florence now a tropical storm is expected to re-strengthen in a major hurricane over the next couple of days. Given it’s present track, it seems to be headed for the south east coast of the US. It doesn’t stop there, the entire east coast will feel some effects from this powerful storm. 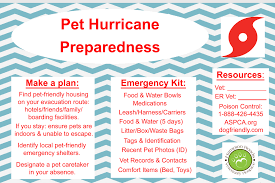 Make your hurricane plans now and make sure that you include your pets. Petfinder has put together a comprehensive guideline on how to prepare for yourself and your pets. Keep this handy, you may need to use it this week! HURRICANE TIPS FOR KEEPING YOUR PETS SAFE! 2) In the event that you cannot take the animal where you are going, please make arrangements to board your animal in a safe and reputable boarding facility or vet office. 3) If you are going to a shelter with your animal please make sure you call your veterinarian before hand so you can get a copy of your pets vet records and proof of vaccinations. Most shelters will NOT take your pet, it the pet doesn’t have at least a rabies shot. Most shelters will NOT take you. This way she// he will be protected from diseases. Don’t wait until the last minute to give your pets their vaccinations as vaccinations can take up to 2 weeks to take up to 2 weeks to be effective. a shelter can be very stressful. Include some scents from home such as a piece of dirty clothing or a blanket. This will make your cat feel more relaxed. Beside a carrier, you are going to need a cage/crate so your cat can be more comfortable while at the shelter. make sure the cage or crate is big enough where your cat can comfortably stand and that the food, water dishes and litter boxes can also fit inside. 5) Getting your pets microchiped is highly advisable, but if the pet is not micro chipped yet, put ID tags on your pet NOW! 6) If your pet takes medications please make sure you have enough to get you through the storm and at least a three week supply for the aftermath. If you don’t have enough now, this is a good time to ask your vet for an additional supply. A cats system is very sensitive. Slightest changes can give them a UTI or stomach problems. Ask for a pill form of an antibiotic. 7) Make sure you have food and water for your pet to last at least two weeks. Bottled water is best. 8) Know your cats hiding places. Try to stay calm, cats can sense human emotions and they make escape to their favorite hiding places when evacuating. 9) I strongly advise never leave your pet alone. If you do (which I would never, ever think of!) never chain them up. Leave plenty of food and water. I will say it again, never leave your pet behind!! 10. Unplug all appliances even the refrigerator. If you have a gas stove, shut off the main line. This entry was posted on Sunday, September 9th, 2018 at 9:50 am	and is filed under Pet Supplies. You can follow any responses to this entry through the RSS 2.0 feed. Both comments and pings are currently closed.